The insurance adjuster for the other driver’s insurance company wants to visit me at my house. What should I do? After my car accident case settles, how long will it take before I receive my check? 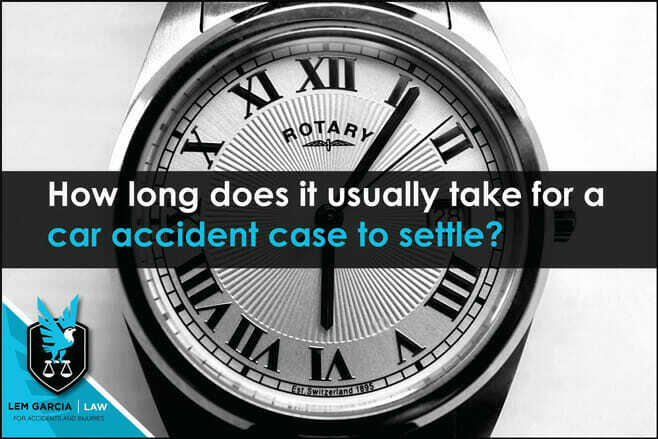 How long does it usually take for a car accident case to settle? After a car accident, you have two cases that can settle: one for your property damage, and one for your bodily injury. Your property damage claim should close relatively quickly. Property damage claims usually resolve within a few weeks, but can sometimes take months – even years – if the insurance company denies that it was their insured’s fault or if there are issues determining whether or not their insured had valid coverage at the time of the crash. Bodily injury claims can resolve within one week or after several years. Most bodily injury claims settle within one year. One of the main reasons why it usually takes up to one year to resolve a bodily injury case is because your personal injury attorney will usually submit a demand letter after you have concluded all of your medical treatment, which usually lasts for several months. The reason why your personal injury lawyer will wait until you have concluded medical treatment to send out your demand letter to the insurance company is because if it was sent out any sooner, the demand would not include all of your medical records and bills. Usually, demand letters include all of your medical records and bills because you want the insurance company to pay for the full extent of your injury and for all of your bills. If the demand letter is submitted sooner, your injuries will not be evaluated to its fullest extent. If your injuries are serious or probably exceed the policy limits that the other party carries, then your accident attorney just might send out a demand sooner and demand the other party’s policy limits because your case is already worth more than their insurance policy provides coverage for. As you might be able to tell, every case is different and it would be inaccurate to provide a specific answer about when most cases usually settle. An experienced personal injury lawyer will be able to maximize your recovery and get it to you as soon as possible. It is important that if you were involved in a car accident that you talk to an attorney that can provide you with some advice. Most attorneys are happy to talk to people even though all they want is some information and advice. Feel free to call West Covina accident and injury lawyer, Lem Garcia, for a free consultation. Lem Garcia Law is a car accident law office in West Covina and provides free consultations to people who have been injured in an accident.